Since I live in Tibet, I have countless travel adventures. Everytime I go somewhere it is an adventure. I am going to start writing about some of my adventures across Tibet. I get emails from people across the globe about how to travel through Tibet. Hopefully these articles will help answer some of those questions as well as give you a bit more of an insight into living and traveling in Tibet. This adventure started in late June 2004. Earlier that year my buddy Billy from Seattle asked me if he could come and out and hang out for a couple of months in the summer. I was planning several trips through Kham and Amdo that summer so I told him to come out. 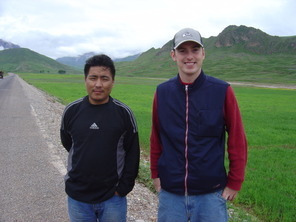 I met Billy in Beijing （北京） and we then flew out to Xining （西宁）in Qinghai province (青海省）. From Xining we took the long sleeper bus down to Jyekundo. For most people, taking the sleeper bus from Xining to Jyekundo is an unforgetable, once-in-a-lifetime experience. Sleeper buses are uncomfortable and are usually filled with cigarette smoke. The journey from Xining to Jyekundo is about 825km (515 miles). Once you get about 75km (47 miles) to the west of Xining you leave China behind and enter the Tibetan world. The landscape becomes rolling grasslands filled with yaks and Amdo Tibetan nomads. Snow-capped mountains can be seen in the distance. This area is called Hainan Tibet Autonomous Prefecture and is known to the local Tibetans as Chabcha. The sleeper bus usually stops in Chabcha for 45 minutes or so for dinner. On this particular trip we stopped at a muslim noodle shop and had some of the popular local noodles. After the stop for dinner, everyone rushed back on to the bus. A couple of hours later the we were driving at 4500m (14,760 ft) across the northern Tibetan Plateau. Most people feel sick and I was no different. My stomach was feeling queazy, I had a pounding headache and I was short of breath.The highest mountain pass down to Jyekundo is just under 5000m (16,400 ft) which is definitely high enough to give people severe symptoms of altitude sickness. The landscape in this area is unlike any other place I have been. Nearly the whole trip from Xining to Jyekundo is above the treeline. There are literally no trees for most of the way. 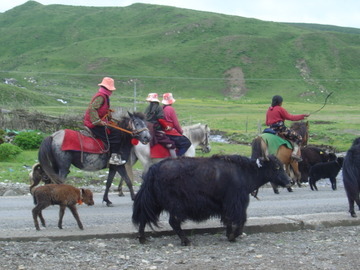 Yaks and sheep are seen everywhere often herded by young Tibetan nomad boys. After 19 hours working our way south through no-man's land we finally reached Jyekundo. Since our trip was in late June I thought there would be no need for a heavy coat or thermal underwear (I had even packed some shorts). Billy and I both brought small backpacks with just the "essentials". When we pulled up to the Yushu Hotel is was snowing! While it was mixed with rain, it was still snowing! This was something we weren't prepared for. We spent a couple of days hanging out in Jyekundo going around to some of the famous sights such as the Gyanak Mani Temple and the Princess Wencheng Temple.Then we took a van taxi and headed south to Nangchen. Van taxis from Jyekundo down to Sharda are located in front of the main bus station for around Y30 ($3.75) per person. From Jyekundo to Sharda (the county capital of Nangchen) is 195km/122 miles and takes 3 hours. Nangchen was an independent kingdom of Tibet basically until the People's Liberation Army came in and established a form of government in the 1950's. Nangchen is rich in Tibetan history and is one of the most beautiful regions of Tibet. Not many foreigners make it down there. The Mekong River flows through much of Nangchen enabling people to grow crops that are impossible to grow in other parts of Yushu Tibet Autonomous Prefecture. It is not uncommon to see Chinese kungfu actor Jet Li walking the streets of Sharda in Nangchen. Jet Li is a Tibetan buddhist who is personal friends with a lama of a local monastery near Sharda. Jet Li recently built a house for monks and is paying for a new monastery to be built in the area. Many local Tibetans report seeing him in Nangchen a couple of times a year. wasn't carrying powdered salt though. It was carrying huge rocks of salt. All of the salt was in bags, but it was hard, sharp and pointy. There was no way to get comfortable among all the rocks of salt. The road was dirt and bumpy so every minute we would get jabbed by a sharp edge of salt. About an hour into our trip the truck broke down. 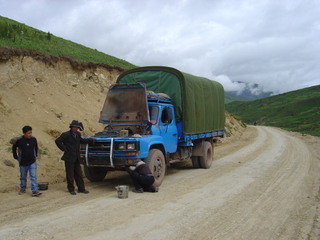 Our driver manged to get it running again, but it broke down another 6 times before we finally reached Riwoche. As I already mentioned, Billy and I didn't plan for cold weather since it was late June when we left. We didn't take any sleeping bags or anything like that. The trip down to Riwoche ending up taking a lot longer than the 10 hours the driver said it would take. It took us nearly 18 hours to go the 244km (153 miles). We averaged only 13.5 km/8 miles an hour! In the late afternoon the temperature began to drop. Being in the back with the rock salt and freezing temperatures along an extremely bumpy road was one of the most miserable experiences of our lives. It was impossible to get comfortable or warm. There was a 3 hour period where Billy and I didn't speak to each other. We honestly didn't know if the other was even alive. We were "laying down" on opposite ends of the truck and we were both too cold to talk or to check and see if the other was okay. Eventually I asked Billy if he was awake and asked him if he was as cold as I was. We were both so cold! We were definitely experiencing some symptoms of hypothermia. Finally at around 2am we pulled into Riwoche. Getting out of the truck was the end of a long and cold nightmare. Billy and I had bruises all over our bodies. We found some trucker guesthouse for Y30 ($3.75) per person and stayed the night there. The next morning we walked around the small town of Riwoche. It was much warmer there than during the previous day's bus ride. Our main objective was to find transportation to Chamdo which was 105 km/66 miles away. We found a van taxi that was willing to take us that way. There is a checkpoint along the way so the driver was a little nervous taking us through it since we didn't have any of the necessary permits for being in the region. 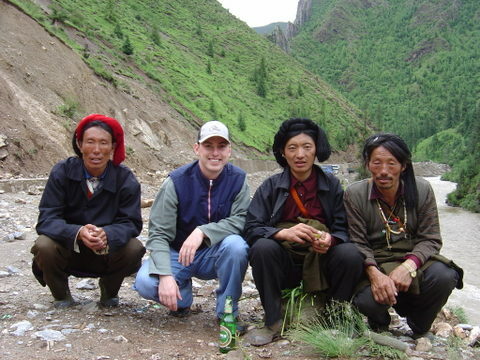 For Y200 ($24) he took the three of us to Chamdo. It was an expensive trip, but he made sure we made it through the checkpoint. The road was pretty bad so it took us 4 hours to cover the 105km/66 miles. Chamdo lies on the Mekong River and is the largest town in the Kham region of Tibet. The first hotel we went to wouldn't accept us because we didn't have the proper permits. We tried a few more and they also wouldn't accept us. Chamdo see's very few foreigners so Billy and I knew that it probably wouldn't take too long for the police to spot us. We finally found a decent hotel that would take us. We found a double room with a shower for around Y100 ($12) which was nice since we hadn't showered in quite a while. We spent the next couple of days hanging out in Chamdo and had no problems with the police. We explored all of the town as well as the hilltop monastery of Jampaling. The next day we went to the bus station to buy tickets to Jomda which was 228km (142 miles) to the east. The bus station wouldn't sell us tickets. They said we had to have permits to be in this region of Tibet. I tried talking to some bus drivers and they also refused to let us on board. We were stuck in Chamdo! We ended up turning ourselves into the police station in Chamdo. There were 3 people at the police station...two Tibetan men and a Chinese woman who was in charge. The two Tibetan men were pretty nice, but the Chinese woman (probably about 25 years old) was not very nice. She told us several times that we were illegally in a closed region of the People's Republic of China. She gave Billy and I (Namgyal is from Nepal and was also supposed to have the necessary permits, but since he is Tibetan no one would think he was a foreigner) fines for Y300 ($36). I tried to negotiate a lower price, but the Chinese woman in charge screamed "This is the police station!! Not a market! You cannot negotiate with the police!!". We then paid the fine. To do the trip legally costs thousands of dollars so I thought the fine of Y300/$36 wasn't too bad. After lunch, one of the Tibetan police officers escorted us to the bus station so we could buy bus tickets. The Tibetan police officer then gave me his card and said that if I was ever in Chamdo legally, to give him a call so we could have dinner together. The next day the three of us headed to Jomda. Jomda is 228km/143 miles to the east of Chamdo. The bus ticket cost Y70/$8.75. A couple of hours into our trip, I noticed a line of trucks and buses in front of us. The roads through this part of Tibet are poor. A rockslide occured and covered the road with 8 feet of bolders and gravel. I though for sure we would be stuck there overnight, but after waiting a couple of hours, a front end loader came in and cleared the road. The picture at the top of this page was taken during our delay. After nearly 9 hours, we finally arrived in the small, one-road town of Jomda. About an hour after we arrived the police noticed us and told us to walk over to the police station. Jomda is still a restricted area of Tibet. The police station in Chamdo had given us a fine so I showed the police in Jomda and they let us go. They just told us not to take many pictures. We stayed at the Jomda guesthouse which was clean, comfortable and only cost Y25/$3 a person. The next morning we set out for Derge. From Jomda to Derge is 65km/41 miles. We took a bus for around Y25/$3 and it took 4 hours. Derge lies in Ganzi Tibet Autonomous Prefecture in western Sichuan province (四川省) and is open to foreigners. It lies just across the Yangtze River. Derge is famous through out Tibet for the Parkhang Printing Press which prints most of the Tibetan scriptures used across Tibet. It was nice to be in a place where we didn't have to lay low from the police. We stayed at the Derge Hotel which is one of the worst hotels I have ever stayed in. The hotel has two wings...one with overpriced double rooms with a bathroom and one with dorm rooms. The dorm rooms were probably pretty nice back in the 1950's, but are in very bad shape now. The first step I took in the room, my foot went through the floor boards. I guess you get what you pay for. The room was only Y10/$1.25 per person. We spent a couple of days roaming the streets of Derge. Derge is considered the cultural heartland of Kham. It is one of my favorite places in all of Tibet. After a couple of days in Derge we headed east to the small town of Manigango. Manigango is 106km/66 miles from Derge. We found a big Kham Tibetan man with a jeep who was going that way. He gave us a ride for Y35/$4.38 a person. Between Derge and Manigango is the high mountain pass of Cho La. Cho La is 4916m/16,125 feet above sea level. When we started making the ascent up Cho La the weather quickly changed. In Derge it was cloudy and mild. As we were heading up this pass, it became much colder. Then it began to snow. It was snowing so hard that we couldn't see out the window. The driver had the windshield wipers on high and we still couldn't see. The driver drove the whole way with his window rolled down. Poor Billy was sitting behind the driver freezing to death. The road up Cho La is narrow and winding. The drop off on the right side is quite far. We were driving through at least 4 inches of snow. I was pretty nervous looking over the edge and seeing the valley far, far below. I was more than a bit concerned. We finally reached the top of the pass. The date was July 6. There was around 6 inches of snow at the top. Snow was falling the hardest I have ever seen in my life. It wasn't just a snow storm. It was a full on blizzard. We had no visibility. Our driver wasn't too concerned. He just kept driving. Eventually we made it down the pass and into Manigango. The trip took a little over 3 hours. Manigango is a very small town in the middle of nowhere. It sits on the intersection of the road from Ganzi town to Serxu. We checked into the Manigango guesthouse which was actually quite nice. A bed in a 4 person dorm was Y15/$1.88. We went across the street to eat some lunch. Billy and I both weren't eating very well and were losing a lot of weight. After lunch, Billy and I set off to find the bathroom. Our guesthouse didn't have one. We asked several people in town where the bathroom was, but no one knew where it was. We ended up having to climb up a mountain to find a private spot. There was no bathroom in all of Manigango! Later that afternoon it began to snow a little in Manigango. Billy and I both wished we had brought coats! The next morning we hiked to the road intersection between Ganzi town and Serxu. There isn't a bus from Manigango to Serxu, so we had to wait for the bus from Ganzi to come and flag it down. We were with about 10 other people. After waiting a couple of hours in the cold, the bus came. The bus was already full when it stopped in Manigango. So they rearranged a few things and somehow got us all on the bus. About a half an hour after we left Manigango our bus broke down. Something was broke on the bus, but it was still driveable. The driver (who was Chinese) told half of us to get off the bus. He then drove back to Manigango to have the bus fixed. So Billy, Namgyal and I along with about 15 others were stranded alongside the road in the middle of nowhere. We had no idea how long the bus would take to come back and get us. We were in the middle of nowhere with nothing to do. Billy and I threw some rocks for a few minutes until a nomad family came our way. The family was moving their whole herd of yak right down the road where we were. It was cool to be able to see nomads in transit right in front of us. After an hour and a half the bus returned and took us the rest of the way to Serxu. Three hours after the bus picked us up, the driver stopped to pick up two monks who were walking alongside the road. The bus driver, who was Chinese, told them he wanted Y60/$7.50 per person to take them to Serxu. Everyone on our bus was Tibetan except for the driver and his assistant. Some Tibetans in the back of the bus told the monks to pay no more than Y30 for the trip, but the driver insisted on Y60. Some of the Tibetans on board then threatened to beat the Chinese driver if he charged them that much, so the driver let them on for Y30. I am sure the last thing that Chinese bus driver wanted to do was upset a bus full of Kham Tibetans who were all carrying knives! From Manigango to Serxu is 222km/139 miles. The bus ticket cost Y70/$8.75 and it took us 7 hours. Serxu is a high nomad town that sits at 4100m/13,448 ft. It is a very poor and remote area in northwest Ganzi Tibet Autonomous Prefecture. There are only a couple of guesthouses in Serxu. We stayed at the "one star" Serxu Hotel. A double room cost Y25/$3 per person. As soon as I got off the bus I found some Tibetan kids who wanted to play basketball with me. Playing basketball at 4100m was not easy. I was fully exhausted after about 20 minutes. I went back to the hotel and rested a while. Later in the afternoon, Billy and I hiked up a high hill that overlooks the town. We met an Amdo Tibetan from Golok in town who showed us the way up. If we were at sea level it would only have taken us about 3 minutes to go up this hill, but at 4100m it took us well over half an hour. The top gave us a great view of the town and the grasslands outside of town. Nomad tents could be seen everywhere. The next day Billy and I left for Jyekundo. Namgyal met up with some friends in Serxu so we left him there. From Serxu to Jyekundo is 125km/77 miles. The bus ticket cost Y30/$3.75 and took 6 hours. In Jyekundo we stayed at the Yushu Hotel where a double room with a shower cost Y140/$17.50. It was the first time we were able to take a shower in quite a while. We spent the next couple of days just relaxing in Jyekundo talking about our wild trip through Kham. Billy had to take a flight back to Seattle out of Beijing, so after being in Jyekundo for a couple of days we took the long sleeper bus back to Xining. A sleeper bus from Jyekundo to Xining costs Y152/$19 and usually takes 17 to 20 hours. That Kham trip of summer 2004 was a memorable one! We saw a Tibetan guy hold a gun to a Chinese guy's head, we nearly froze to death in the back of a rock salt truck, we were detained by the police...twice, we were caught in a blizzard on high mountain roads, we were in a town without a toilet, we were stranded alongside a remote road with nomads, we were caught in a rockslide and we nearly saw a bus full of Tibetans beat up a Chinese bus driver. I have had many adventures through Tibet, but none compares to this one. 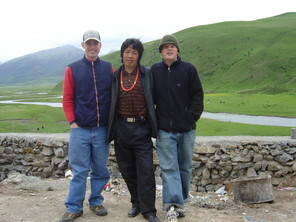 I want to say Tashi Delek to my buddies Billy (right) from Seattle and Namgyal (above) from Kathmandu for spending those 17 or 18 days with me in Kham. Let's do it again soon! It's amazing that experience so far from us, but so real at the same time. hey bro, i just wrote this same story for one of my classes in school. im glad that we remember it the same way. and tell tamara hi for me.